The Leftovers has a problem most television shows would love to have. It’s now two related but essentially separate shows in one, both of them eminently compelling, richly detailed, expertly performed, and lovingly shot. 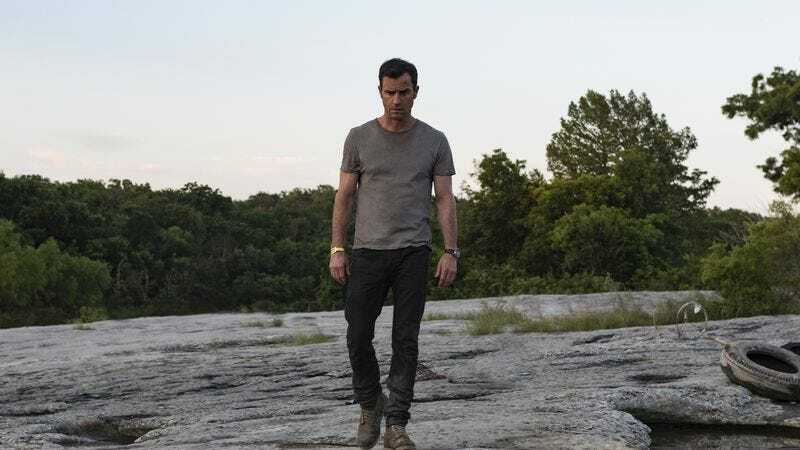 The only downside to season two of The Leftovers is not knowing which of those shows will occupy each episode, and the viewing experience is akin to alternating between hours of The Walking Dead and Fear The Walking Dead. After “Axis Mundi” cast its spell by introducing the intriguing Murphy family, it felt like there wasn’t enough room in The Leftovers for Laurie, Tommy, and Meg. I quietly dreaded a return to the all-heat-and-no-light Mapleton milieu, but then “Off Ramp,” The Leftovers’ finest hour yet, upended my expectations once again. After weeks of dying to know what happened to Evie Murphy and her friends, I went into “Orange Sticker” slightly bummed about having to wait indefinitely for an update on Tommy and his healing hugs. You know a show is slaying everything when your biggest complaint is not getting to spend enough time with the characters. Still, “Orange Sticker” continues The Leftovers’ season two winning streak with a triumphant return to Miracle, a town watching helplessly as its privileged status begins to slip away. The disappearance of Evie and her friends is an incredibly smart way to advance the show, considering how little interest Damon Lindelof and Tom Perrotta have in answering the big questions. Instead of providing a tidy explanation for the Sudden Departure, Lindelof and his team have miniaturized it. The mass disappearance of millions of people around the world is difficult to conceive of, and it’s too massive a tragedy to feel intimate. The disappearance of three young girls from a quiet Texas town with a population well under 10,000 has the same impact on that community that the Sudden Departure had globally. And the loss is more acutely felt in Miracle, a town known for more or less staying the same while the entire planet changed around it. The losses are more acute to the audience too. Aside from the crying baby in the opening scene of the pilot, Evie and her friends are the first characters we’ve actually gotten to see before they disappeared. “Axis Mundi” didn’t spend a ton of time with Evie, but she was sketched with enough detail that the audience is actually experiencing the loss rather than watching characters deal with the loss of someone we’ve never met. Experiencing that sudden, inexplicable loss makes it even easier to empathize with Nora as she startles awake during the earthquake and finds Jill and Lily exactly where they’re supposed to be, but Kevin is nowhere to be found. She desperately turns on the television and opens her laptop, so wracked with grief and panic that she forgets they don’t have service yet, because she has to know if it happened again. Nora seemed genuinely surprised in “A Matter Of Geography” when the scientists who bought her house suggested that the Sudden Departure may not be an isolated incident. When Nora hears that Evie and her friends have gone missing, then sees what appears to be an emancipated dog, she thinks the same curse responsible for taking her entire family has stalked her all the way to Texas. Kevin is safe, of course, after waking up in the drained lake where Evie disappeared with a cinder block mysteriously tied to his ankle. Kevin and Nora have committed to being transparent with each other at all costs, so he’s forthcoming about where he woke up, and she immediately goes into crisis mode. For the mysterious new family in a town that has its population carefully managed and monitored, it’s less than ideal to be tied directly to the disappearance of a local girl. And Kevin is securely tied to Evie’s disappearance, between his missing cell phone, which he finds with help from Ghost Patti, and his muddy handprint on the car window. Kevin and Nora volunteer to help search for the girls, fueled equally by the desire to help find their missing neighbors and the desire to scrub the scene of any sign of Kevin’s presence. It’s yet another example of how season two improves on season one. In Mapleton, the characters faced abstract threats. Even the tangible antagonists, the Guilty Remnant, are more of an insidious presence than an actual threat. Now, Kevin and Nora face a much more concrete crisis, which lends The Leftovers an immediacy it’s never had before. Nora, who convinces Kevin to handcuff herself to him at bedtime, would be far more worried if she really knew the danger Kevin is in. It can only be a matter of time before that handprint ties Kevin to the scene of Evie’s disappearance, and John is the “burn your house down now, ask questions later” type. John concludes Isaac was somehow involved in what happened to Evie and shows up to his hotel to violently confront him with Kevin in tow, and he’s so righteously angry he’s barely fazed by a bullet to the gut. There’s a potentially fatal confrontation brewing between the Murphys and the Garvey-Dursts. Especially if there’s no logical explanation for the girls’ disappearance, and according to Ghost Patti, no such explanation is forthcoming. Ghost Patti is the only real weakness The Leftovers has exhibited in season two, and I can only hope that by finally acknowledging her “presence,” Kevin has rid himself and the show of her presence. Ann Dowd is a phenomenal talent, and it feels ungrateful to complain about her inclusion in the season. God knows if you’re making a show with Dowd on the cast and you can figure out how to keep her around, you figure out how to keep her around. But the character creates too many problems. For one thing, Ghost Patti isn’t terribly different from Ghost Harry, the paternal projection in Dexter. Most of Ghost Patti’s dialogue serves no purpose other than to call attention to what the audience is already watching take place, which is awfully blunt for the same show that began its season with that confounding prehistoric cold open. The other issue is that Ghost Patti simply asks too much of the audience. It’s one thing to watch a show about the unexplained disappearance of millions of people and live with never knowing any more about what happened than the characters do. It’s another thing to have to deal with the sudden reappearance of a person who is supposed to be dead and gone. If anyone should know by now that there’s danger in layering mysteries upon mysteries, it’s Lindelof. The title comes from the sticker placed on each house in Miracle as the government went about verifying that there were, in fact, no departures from the town. Watching Michael remove the sticker is heartbreaking. I’m already ‘shipping Michael and Jill. Seems like there would be less interest in the Miracle water after the girls went missing, but no such luck. I loved the scene with Nora and the pastor in church, when he talks about his catatonic wife’s momentary lucidity. It speaks to the sudden disappearances that happen every day under completely normal circumstances. Tower Joe, which is what I’m calling him until further notice, can also see Ghost Patti. Interesting. Ghost Patti totally Rickrolled Kevin. Lindelof wrote this episode with Tom Spezialy, formerly an EP on Desperate Housewives. They must have met and bonded back in their “We saved ABC” days.